It was a night to remember for Wanganui resident Thelma Good, who shows me a yellowed newspaper clipping from the Wanganui Chronicle proclaiming the ball a great success and the social event of the year. 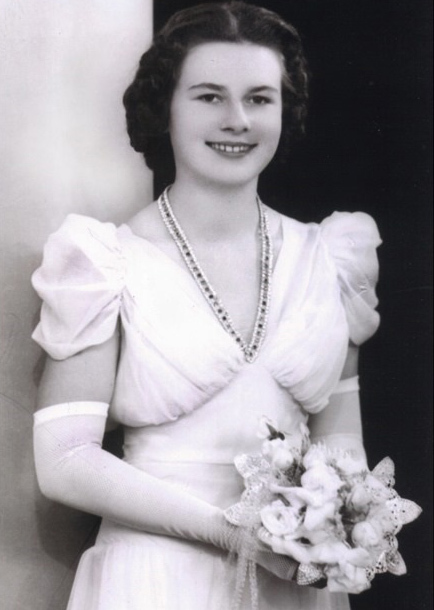 Thelma was one of 10 debutantes presented to the Mayor and Mayoress, Mr and Mrs WE (Bill) Rogers; she is now a gracious and lovely lady whose looks and active lifestyle belie her 91 years. I persuade her to show me her photo, taken on that long ago night when the fragile peace that had blessed her Wanganui childhood had already been shattered in Europe and New Zealand was preparing to send its young men into the horrors of yet another World War. The fresh-faced 17 year old beauty is wearing a puffed sleeve frock of ivory georgette, described in detail in the next day’s Chronicle along with those of her fellow debs. They’d been taught to walk properly and curtsy by the Marshall of the Debs, Mrs Dr Widdowson. Thelma loved drama and ballet so she was in her element and after a lifetime involvement with Repertory Theatre she is now its patron. Thelma’s partner for the ball, Barry Pritchard, escorted her through the Sarjeant to be introduced to the waiting Mayor and Mayoress and she danced the night away to mainly swing music provided by the popular Gus Large orchestra. The Chronicle’s list of those attending includes several names from Ohakea but Thelma says there were still enough young men in town to attend a grand ball reflecting the spirit of earlier times. The mass call-ups came later. It was several years till she met Lindsay, the love of her life, who later wrote a well-received book about his war years. They married in 1946 and Lindsay became general manager of R&E Tingey and an office holder in Jaycees and Rotary. He died six years ago and there’s a photo of him at his beloved piano on the wall of the sunny lounge in the home they shared for 61 years. But Thelma insists this isn’t a story about her; rather it’s about the Sarjeant’s glamorous role on that night in 1940 and – notwithstanding its current temporary closure awaiting earthquake strengthening and extending – its continuing contribution to the life of the Wanganui community. The morning after the ball, the Chronicle reported that “no effort had been spared to provide unusual decorations, artistic lighting effects and delectable refreshments”, although ball goers were taken by bus down the Queens Park hill to the Savage Club for a sit-down supper amid lavish floral arrangements. “Floodlit, with beautiful effect on the exterior, the gallery building within was strongly illuminated, the unusual effect emphasising the graceful lines of the architecture and enhancing the charm of the dresses worn by the dancers,” said the Chronicle. Thelma particularly recalls the stunning effect of the floral decorations in huge bowls in each bay. Tall palms, dahlias, cyclamen and zinnias were among the colourful displays, with giant mirrors in each bay reflecting both flowers and dancers. The orchestra played from a dais in the centre of the third bay, in view of the entrance, and the music was amplified throughout the building. 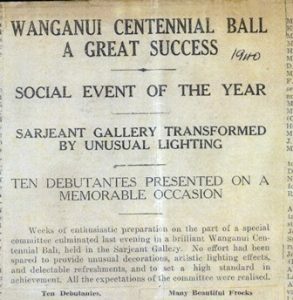 The Centennial Ball was a highlight of a week of centenary festivities that also included a sailing regatta, a combined church service in Cooks Gardens, Maori concert and historical tableau, processions, marching championships, surf championships at Castlecliff and a Past vs Present cricket match at Cooks Gardens. It all marked the end of the era of peace and prosperity since the end of the First World War just 21 years earlier. 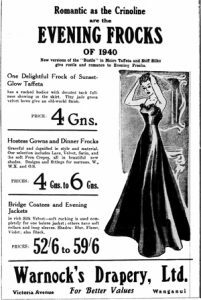 There were to be no further such grand events until the men and women returned home and life in Wanganui again settled into routine, with its annual ball seasons eagerly awaited by many. 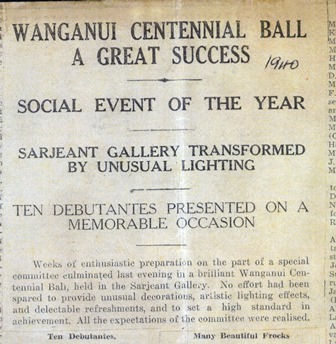 After a period of controversy about the Sarjeant’s administration and financing, Wanganui City Council assumed full control of the gallery shortly after its night of glamour in 1940, and the grand old lady of Queen’s Park settled back into her central role as guardian of our art treasures.